One of my favorite content creators recently told me that she knew I’d stopped blogging but would like to pass me something anyway. I was floored! I stopped blogging? Then I came over here and looked…. and lo and behold. It certainly looked that way. Ooops. So in honor of my horrible revelation (courtesy of Roslin Petion) and Fleur’s fabulous skins…. I bring you their newest release. Parfait Deux! Now, you may notice (or you may not) that this is not my normal shape. While the Parfait line does look fabulous on me and always has, I prefer it even more on this shape. This is a plump little sweetie of a shape that I keep just for these skins. I don’t always put it on when I wear a Parfait skin, but often I do, because she’s just too cute to resist. This release has two major high points. First are the new makeups. Of course. But second is a slight modification to the nostrils. I guess some people were having issues with the way the skin looked on their adorable little button noses. Well this release has solved that so everyone can wear the Parfait fabulousness. Let me lead off with my favorite. This is the Vanilla Deux Parfait 3. It’s my favorite skin tone in the Parfait line and easily one of my favorite makeups across the board.All of the Parfait skins have these sweet little upturned lips and this one features a few tiny little freckles, although not a face full of them. Anyway, I love the flushed cheeks and fresh-faced look of this skin and it’s one I can see myself wearing around often. More Fleur goodness after the cut! March 31, 2008. fleur, review, skin. 3 comments. The other day I was fortunate enough to have a review copy of this jewelry passed to me by Yabusaka Loon. To be honest, I’m positive I’ve seen some of this jewelry in the past but not like this. This set called 06 is absolutely exquisite. The choker may require a bit of fitting, but Yabusaka has made the pieces modifiable so you can easily stretch and reposition it to your avatar’s needs. Overall, I really like this set and I’m glad I had the opportunity to review it for all of you! Check out Yabusaka’s shop in Honmoku or visit the blog for more of Yabusaka’s work. February 13, 2008. Tags: jewelry, review, sculptie, yabusaka. jewelry, review, yabusaka. 1 comment. This weekend has been jam packed with fun fashion for me. But I really wanted to highlight the Second Mirage fashion show I went to. Britneyj Crimson was gracious enough to put on a special show for the fashion press and we behaved well and kept this all under wraps until the public show today. But now that’s it’s over, I can tell you all about it! Second Mirage is bringing out a whole new collection or rich, luxurious jewelry. So much that I can’t even show it all to you. But I did want to highlight a few of my favorite pieces. This piece is called Striking and indeed it is. I think the beading and the shape of this necklace are very unique and I love the simplicity. Makes it feel elegant even without the glitz and glitter. This is probably my favorite piece of the evening. Don’t be confused though, I’m a simple gal but the glitz, glitter and oooooh! the shiny! never fail to draw my attention. And for that reason, these piece called Divine shown here in black diamond draws me like a fly. This, to me is classic Liz Taylor and embodies the spirit of the collection. Plus I really like the texture on the black diamond gems. While we’re discussing pure glitz and glamour, I’d be remiss if I did not show you the Glittering set in ruby. Look at the way the piece cascades down the neck here. I think the overall shape of the necklace is very unique and classy. Plus I love that the earrings don’t overwhelm the set. It’s attention-grabbing for sure, but not quite as bold. And finally, I’d like to point out Luxuriant in ruby. Of the glitter I’m showing you here, this is the quietest variety. But I don’t think that means it is quiet jewelry by any means. It is still a statement and it’s still gorgeous but the glitz factor here is taken down just a tiny notch. This is a shorter necklace but I really like the shape of the diamond accents here. All in all, I can see this jewelry will be coming to formal events with me often. I can hardly wait to show off the pieces which have made it ito my inventory. Thanks again to the entire Second Mirage team and to Britneyj Crimson for the fabulous show. Don’t forget to visit Second Mirage to see these pieces in person and pick some up for yourself. January 30, 2008. jewelry, second mirage, Uncategorized. 2 comments. When Tenshi dropped a sampler pack from her shop [CRAP] on me, I knew it was just the thing I’d been looking for on many levels. First of all, I needed to blog again. But even more, I needed an excuse to play with her creations. For instance, take a look at me here. That’s the Big Knit Big Collar jacket in red and the Bucket Hat in charcoal. I really like the shape of the jacket, especially the oversized shawl collar. And I love that the hat fit over the hair I wanted to wear with this outfit. Plus all the prims are mod/copy/no trans. (Thanks Tenshi!) I feel like I should have a cigarette and be somewhere far more glamorous than my photosphere. As of yet I’m not sure exactly where though, so you’ll have to deal with this. January 23, 2008. crap, review. Leave a comment. Okay okay, I got tagged. I think the whole world has been tagged at this point, so I’m just going to answer and fail to pass it on. If you think an SL blogger has been missed somehow, feel free to tag them in my name! Many of you may know I have a tattoo, but did you all know I got it while I was in Chicago for SLCC? (Some of you knew that too. So just don’t answer.) I did. The tattoo is of heart shaped cherries on my lower abdomen by my right hip. Now you know. I never learned how to ride a bike. Every time I tell people this, they become determined to teach me. No thanks. I have survived 30 years on this planet without knowing how, and I think I’m going to be just fine now. As a little girl, I loved He Man. I had a crazy little girl crush on him. I used to run around my back yard and call myself She Woman, but only in my head. I was crestfallen when they brought out She Ra. I’d been using the wrong name all those years! Plus, she stole my cartoon man. I am a horrible procrastinator. I will put off anything and everything until the very last second possible, without fail. I played the violin for 12 years, starting in elementary school and ending when I graduated from college. This may come as a shock, but I was actually good. I still have the violin under my bed, but I haven’t touched it since I left college. I’m guessing the result if I did now would be painful at best. I used to have a very typical and very destructive need to chase after bad boys. Long hair, sports cars, biker jackets, and bad grades would attract me in a heart beat. It was probably mildly amusing to others as I was (and still am) a giant geek. That never stopped me from dating them though. Thankfully I outgrew it and now find a wicked sense of humor to be the sexiest thing a man can have. I majored in Spanish in college with the intent to become a high school teacher. I got as far as actually doing my student teaching when I realized I am a terrible no good very bad teacher. I dropped out before even completing the certification program and never looked back. Now I work in IT and sit in a cubicle. It doesn’t make me happy, but I’m much better at it, at least. I have never in my life rented an apartment on my own. I have rented apartments with other people. I have owned a house on my own. But never rented by myself. I am now doing things completely backwards as I have sold my house and am moving into my very first apartment that is all mine. It feels like a giant step forwards and backwards all at once. Also, while I have you attention, please note that the above mentioned move is very much messing with my available time. I may not be in world or writing here very much until sometime next year. I do my best, but priorities get me every time. So fear not, I’m fine. Just insanely and prohibitively busy. December 4, 2007. journal, me, social, Uncategorized. 3 comments. More and more lately I have been experiencing a surprising problem. I just know I can’t be the only one. It is the plague of the no mod prim. There is a time and place for the no mod prim, to be sure. But unfortunately, it is never as an attachment to an outfit. Lately I have purchased too many things with no mod skirts or cuffs. These items are often fitted to the creator’s avatar or one made especially for clothing creation. I understand they have to be fitted initially to *something*. But these prims also need to account for the fact that with all the sliders and shape possibilities in SL, that prim is never going to fit everyone as is. Sure sure, no mod prims do allow the ability to adjust their position. However, often times this just isn’t enough. If the original skirt prims were fitted to a slender avatar and then are placed on an avatar with generous hips, no amount of placement adjusting is going to make them fit. And the problem compounds from there. If I can’t make an outfit fit correctly due to lack of ability to modify, it is no good to me. I need to either trash it or give it away. Frankly, I’m unlikely to give it to someone else just to inflict the same issues on them. So into the trash it goes. And that makes me very much less likely to ever spend more $L in that particular shop. So not only does my poor little fashionista heart weep, but the shop loses a customer. Such a complicated plight with such a simple answer. Please please please, I beg of content creators everywhere, make your prims mod/copy. This little shopper would thank you so much. December 3, 2007. fashion, prims, suggestion. 9 comments. Today the fashion world in SL is acknowledging a tragedy. I feel like it’s not my place to commiserate as I never really knew Ginny Talamasca. 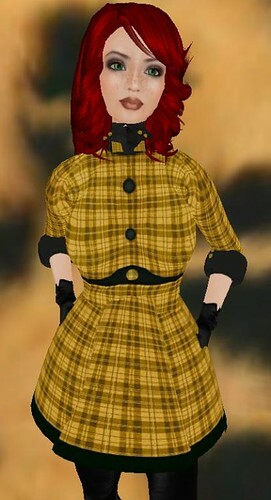 But for the 2+ years I’ve been in SL now, I have been shopping at Dazzle and Last Call and enjoying Ginny’s creations. So while I don’t have a personal connection to Ginny, I am empathizing with the sense of loss. My thoughts go out to Ginny’s friends and family during this difficult time. I can’t do much, but the best tribute I have is to wear Last Call today with pride. Ginny, this one’s for you. Outfit is Dominica from the Catwalk Collection by Last Call, boots are Melisande in Mohagany by Last Call, necklace is the Platinum Heart tag Necklace by Elexor, and the hair is Europa in dark red by Cake. November 10, 2007. Last Call, tribute. 1 comment. As you can see from the picture here, I was feeling quite sassy yesterday. Too sassy for my skirts and dresses… I was ready to run around out on the town. Here I’m wearing the Gwyn sweater from MG Fashions, Strict jeans from LF Fashions, Lollie shoes from Shiny Things as well as some of Fally’s plum knit tights. The skin is custom made just for me by Tete a Pied, and the hair is Wish from Cake in currant. The determined sassy look on my face is all me though. Want to know what I did next? More after the cut. November 6, 2007. Cake, exploring, LF Fashions, MG Fashions, Shiny Things, Shopping, Tete a Pied. 2 comments. A while ago (shamefully so, in fact) Annyka Bekkers dropped a sample pack of her Mellie skins from her shop Blowpop on me. I tried them on right away, but then got distracted by that darn first life and haven’t blogged them yet for all of you. I’m going to talk about the Cream skin tone as that is my normal choice. If you like what you see here, you should go to Blowpop yourself and try a demo. First of all, Cream is not the lightest skin tone, Vanilla is, and the skins range to a deep tan called Caramel with a few steps in between. As I said before, these are the Cream. In the sampler Annyka gave me, these are the three makeups that were included for Cream. She has obviously taken care to create a range of makeups as well from fresh faced to evening makeup. But let’s look at my very favorite thing, the lip. I think the lips on these skins are so sweet and I love the little upturned corner and sweetheart shape. They are what makes the whole face for me. The shading on the bridge of the nose is a bit stronger than I’m used to, but I don’t think it’s bad. It’s just different for me. The nostrils are well done though, and that’s a difficult area where I have issues with some skins. I also think the eyes are very well done and I appreciate the range of makeups Annyka has applied to them. I think it gives these skins a lot of versatility for her customers. The skins will allow you to play with the hair color on the eyebrows and other bits, but I didn’t experiment with that for these pictures. I wanted you to see them as they are, and play with them on your own. I will also note that I will not be taking full body shots or analyzing other bits of the skin. Not my style, and the face on a skin is the number one most important feature to me, so that’s my focus. Although I will point out that the collarbones, which you can also see here, are nicely done. All in all, I’m glad Annyka got in touch and I will be adding her skins to my rotation. Again, these are the Mellie skins, and you can find them in her shop, Blowpop. October 22, 2007. blowpop, review, skin. 2 comments. It all started when I saw that there was a coat named Madison. Of course, I am not so vain as to believe that has anything to do with me, especially since I have never met the designer, Noelle Eilde, before. However please take note, this will not stop me from pretending far and wide that I am famous enough to have a jacket named after me. 😉 Regardless of the origin of the name, seeing this coat led me to Argyle Boutique, and that is definitely not a bad thing. I proceeded to buy nearly everything in her shop and then decided that you, dear readers, needed to know all about it. Please note that the jacket in question here is absolutely adorable. It has an optional prim collar and neck bow which I am modeling both of for you here. I am also taking this opportunity to show off the Davenport Weathered Velvet gloves which just go perfectly with my jacket. Stick around after the cut for more great finds at Argyle Boutique! October 14, 2007. Argyle Boutique, new find, review. 8 comments. 9,141 have strolled the avenue.